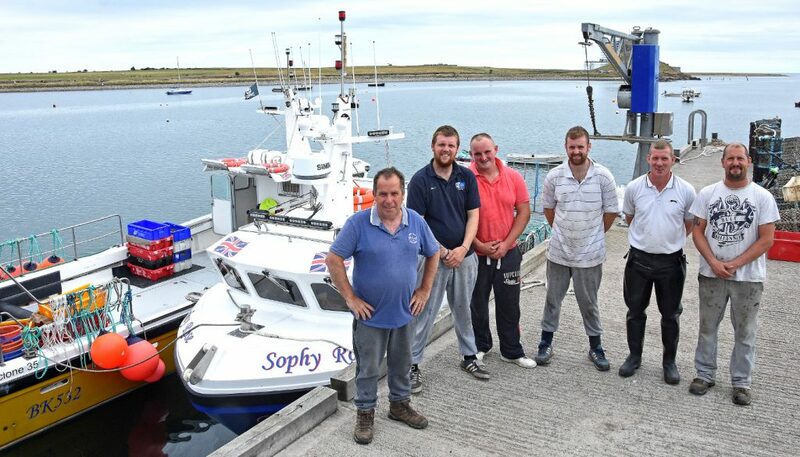 Sophy Rose is the second Cygnus Cyclone 35 to be built by Murphy Marine Services on Valentia Island, Co Kerry for Holy Island owners Shaun Brigham and Richard Ward, who took delivery of Freedom B BK 532 just over three years ago. 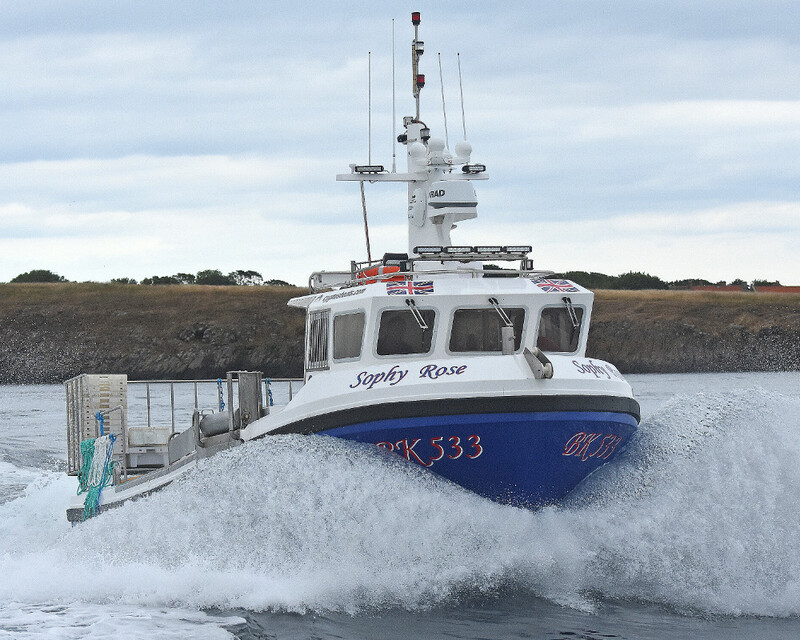 The impressive build quality, seakeeping qualities and fishing capabilities of Freedom B, which they are continuing to work, led to a follow-up order being placed when the decision was taken to replace skipper Jordan Richardson’s previous boat, Fulmar II BK 533. 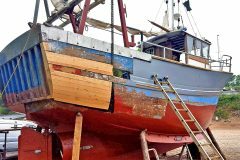 This decision reflects the strong bonds, based on customer satisfaction and trust, that now exist between owners Shaun Brigham and Richard Ward and boatbuilder Fionan Murphy. Shaun Brigham said: “Once again, Fionan Murphy and his team have delivered in full, both in terms of their willingness to incorporate our suggestions for changes – which, although minor in themselves, will bring significant benefits in years to come – and in the end product, the quality of which speaks for itself. Freedom B is a superb boat, and we have no doubts that Sophy Rose will deliver similar levels of performance. Ready for the hard work that lies ahead, left to right: Shaun Brigham, Jordan Richardson, Edward Sinclair, Daniel Richardson, Richard Ward and Jamie Douglas. 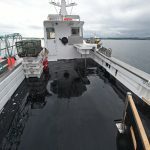 To anyone who didn’t know that Freedom B had fished for three years – during which time more than 300,000 pots have transited the working deck – the difference in year of build between the two boats, as they lay alongside each other at the pier to refuel and take bait, was not discernible by visual appearance. The whalebacks, wheelhouses, working decks, bulwarks, stainless steel cappings and safety rails were immaculate on both boats. 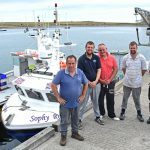 This is a testament to the level of care Freedom B has benefited from since starting to fish from Holy Island, as well as the build quality Murphy Marine Services provided, in line with the owners’ requirements. 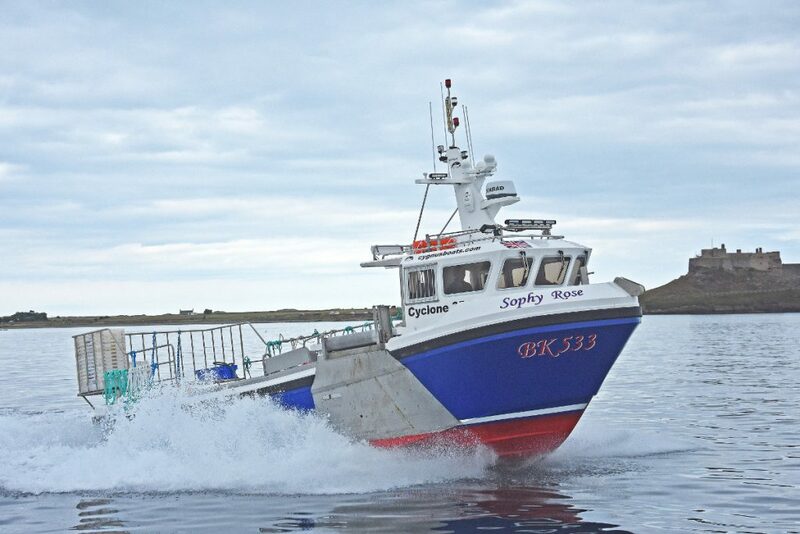 Taking her name from Shaun Brigham’s two daughters, Sophy Rose arrived at Holy Island a few months after her predecessor, the Cleopatra Fisherman 33 Fulmar II, was bought by Shetland skipper Ronnie Young and renamed Cornucopja LK 372 (Fishing News, 8 March, 2018). Powered by a Cummins 6CTA8.3 engine, Cornucopja was built in Iceland by Trefjar in 2003 as Soph Ash 2 BK 533 for Burnmouth skipper John Affleck. 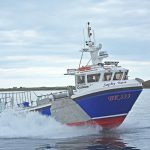 Six years later, the fast semi-displacement potter moved the short distance south to Holy Island and was renamed Fulmar II by new owners Shaun Brigham and Richard Ward. 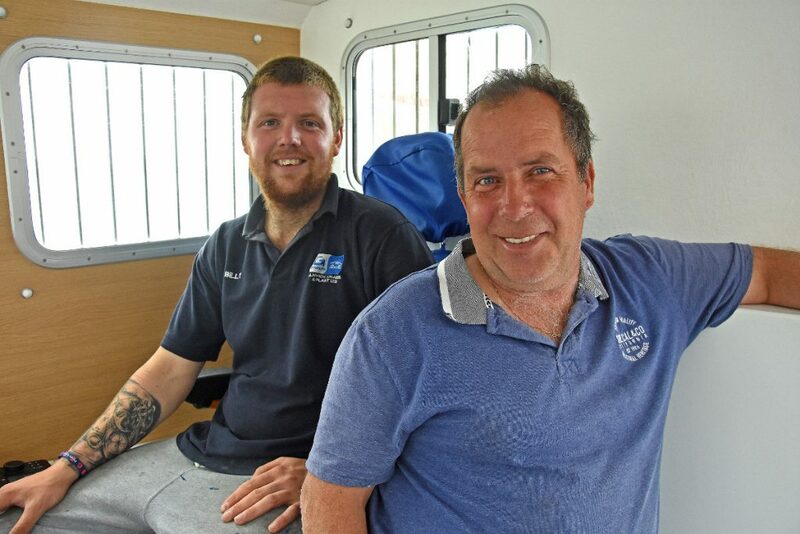 When Freedom B was delivered in 2015, Jordan Richardson and his brother Daniel (now onboard Freedom B) took over Fulmar II, having previously fished the Plymouth Pilot Our Margaret. 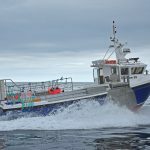 On completion of engine trials, Sophy Rose left Portmagee, Co Kerry, at the start of a 900-mile delivery trip to North Northumberland. 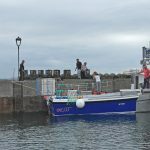 After rounding Mizen Head and steaming along the south coast of Ireland towards the Scilly Isles and Land’s End, Sophy Rose completed the first leg in 17 hours on arrival at Newlyn. 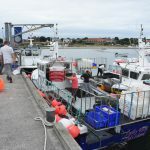 Following subsequent stops at Weymouth, Eastbourne, Lowestoft and Scarborough, Sophy Rose was moored for the first time at Holy Island six days after departing from Ireland. 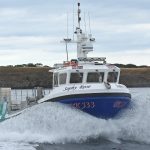 Insured by Sunderland Marine, and landing daily to DR Collin & Son Ltd of Eyemouth, Sophy Rose is expected to fish within a 40-mile radius of Holy Island, in an arc running from Goswick Bay in the northwest to the back of the Longstones in the southeast. Sophy Rose joins Freedom B at Holy Island against a backdrop of the Inner Farnes. 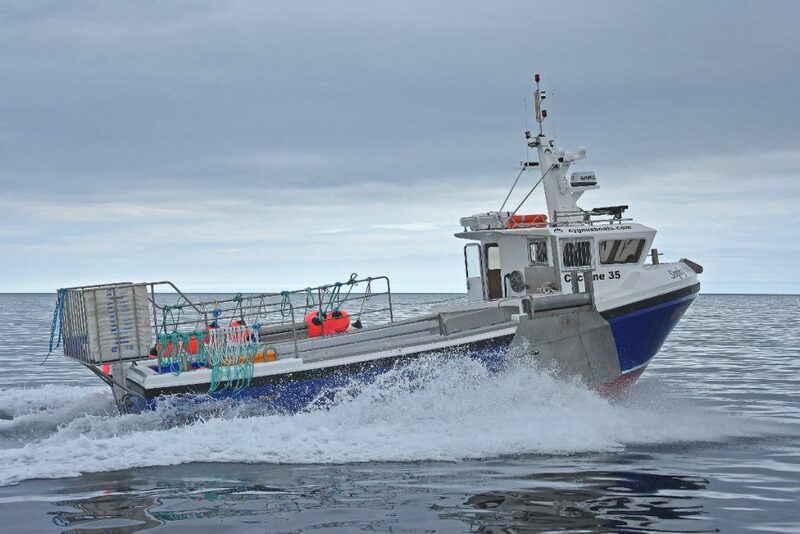 Sophy Rose and Freedom B fish double soft-eyed D-section parlour pots, ranging in size from 36in to 46in, supplied by Caithness Creels, East Coast Creels and Gael Force. These are worked in leaders of 35, spaced at 12-fathom intervals on 14mm-diameter Seasteel back ropes from Gael Force. 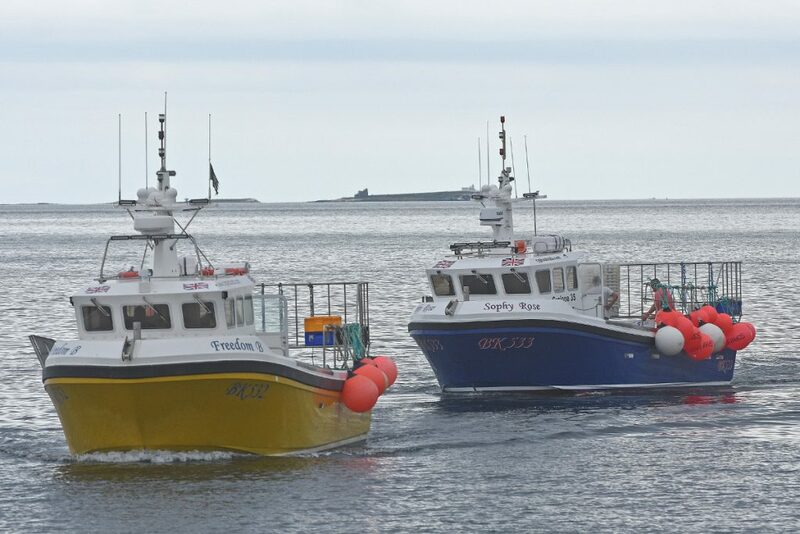 Each pot fished inside six miles displays a numbered tag allocated to Sophy Rose, under the terms of the vessel’s shellfish permit issue by Northumberland IFCA and the authority’s 800 regional pot-limitation order. Moulded and fully fitted out to Seafish specification, and the owners’ specific requirements, Sophy Rose has main dimensions of LOA 10.3m, beam 3.8m and draft 1.1m. The broad beam planing GRP hull incorporates a medium V-entry and reversed gull wing chines which, carried right below the waterline, provide very high stability for this class of vessel. 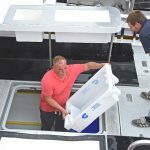 The Cyclone 35 hull is designed to give maximum buoyancy and a comfortable rise in varying sea conditions, to deliver minimal slamming and a stable and dry working platform. The wide deep V hull also allows a large load to be carried on deck without an excessive increase in draft or loss of freeboard. These design characteristics enable the hulls to remain on an even trim when carrying a leader of gear on the portside, and to continue to be easy to handle. 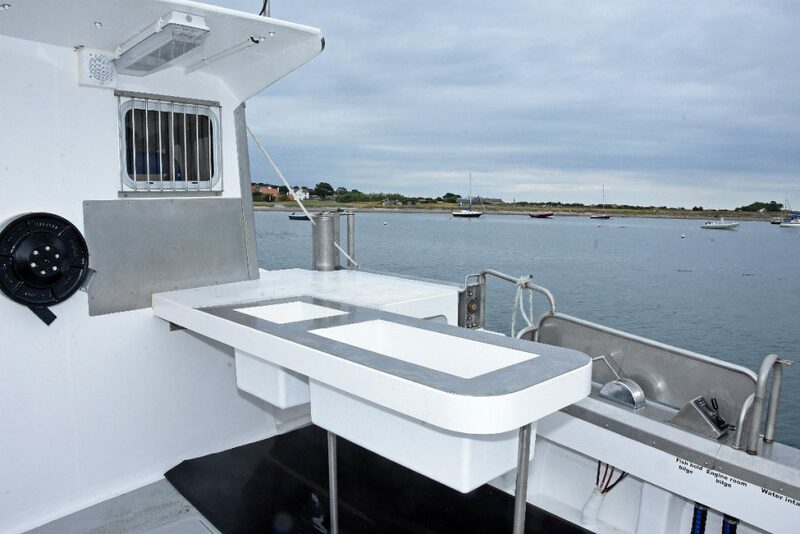 Reflecting the high level of specification requested by the owners, the cat-catcher cradle fitted across the transom, together with the safety rails, were fabricated using stainless steel. 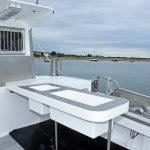 Murphy Marine Services used the same maintenance-free material to fabricate the deep gunwale rail cappings. Two flush deck hatches, positioned along the centreline of the main deck, give access to the main dry hold abaft the forward wheelhouse and the engineroom, which is positioned slightly aft of amidships. 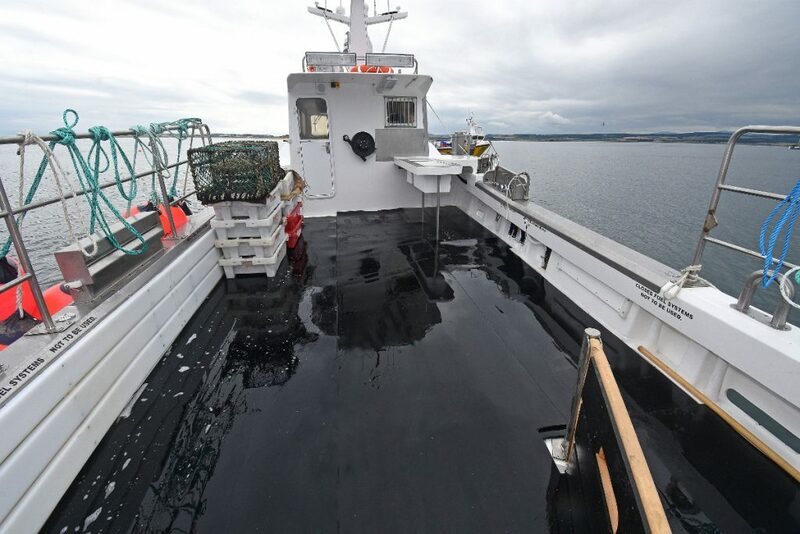 A third hatch offset to starboard provides alternative and readily available access to the engineroom, should any problems arise when a string of pots is stowed on deck. Sophy Rose features a gunwale roller system and stern gate for pot self-hauling and shooting. direct lead outboard to run over the customary large-diameter stainless steel roller mounted on top of the gunwale rail, below which a stainless steel wear pad extends downwards to the waterline. Two vertical stainless steel rollers are positioned at the forward end of the gunwale rail roller, to keep the back rope in position as Sophy Rose hauls herself up to the gear. In a recent development, most of the tension in the back rope during hauling is absorbed by a bigger roller positioned slightly inboard of a smaller-diameter roller. 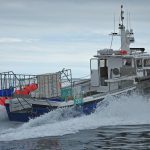 Well-protected duplicate Kobelt engine and Simrad autopilot controls are mounted on the gunwale rail aft of the hauling position, for easy use on occasions when unfavourable tide and wind conditions require some manual assistance. 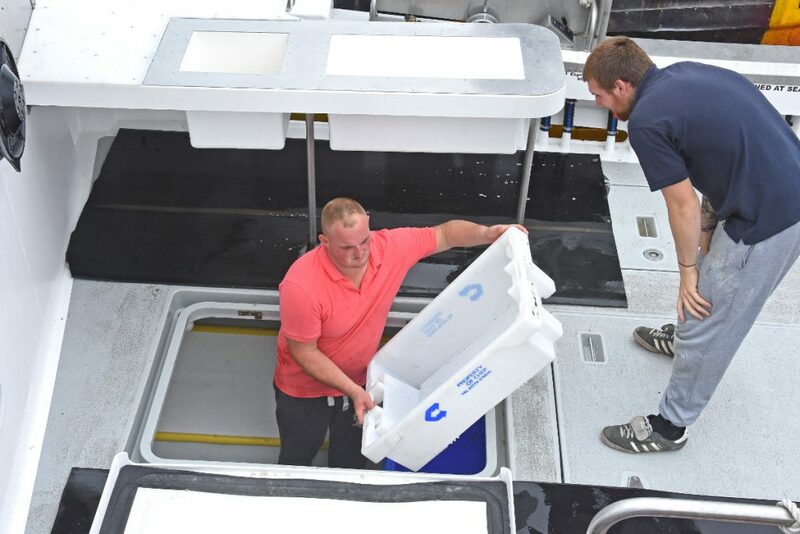 On clearing the water, pots are immediately hauled onto a custom-designed stainless steel clearing table, before they are turned through 90° and slid aft along the elongated structure that includes two built-in bait troughs. The FPT Cursor C9 propulsion unit is derated to deliver 161kW @ 2,600rpm. Cleared and rebaited pots are stacked two-high along the port side, from where they are shot away again through the portside opening in the transom. 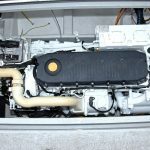 Sophy Rose is powered by an FPT Cursor C9 compact six-cylinder engine. 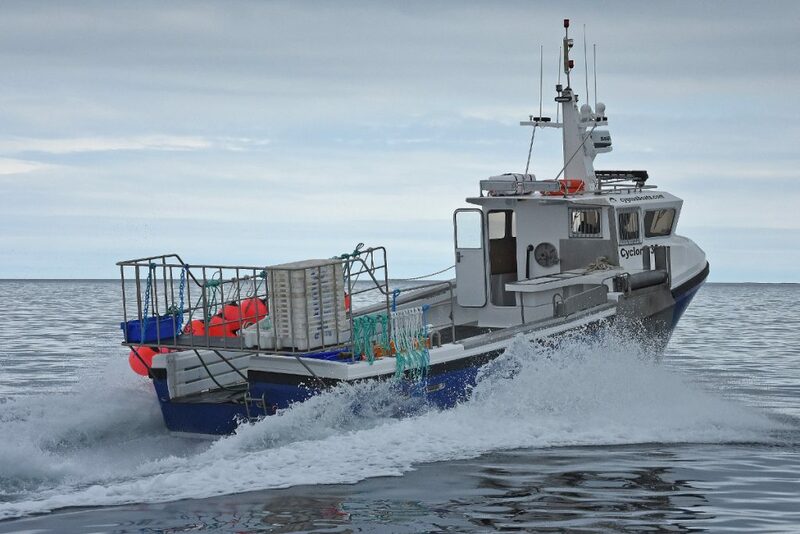 Supplied by Kirwan Technical Services, agents in Ireland for Marlin Marine of Southampton, the propulsion unit is factory-derated to deliver 161kW @ 2,600rpm and turn a 625mm-diameter x 500mm-pitch four-bladed right-handed propeller through a PRM 2:1 reduction gearbox. Clements Engineering supplied the propeller, together with the 50mm-diameter F51 Duplex shaft. When running off in the early morning and moving between gear, skipper Jordan Richardson usually runs Sophy Rose at a service speed of around 16-17 knots (2,300rpm). 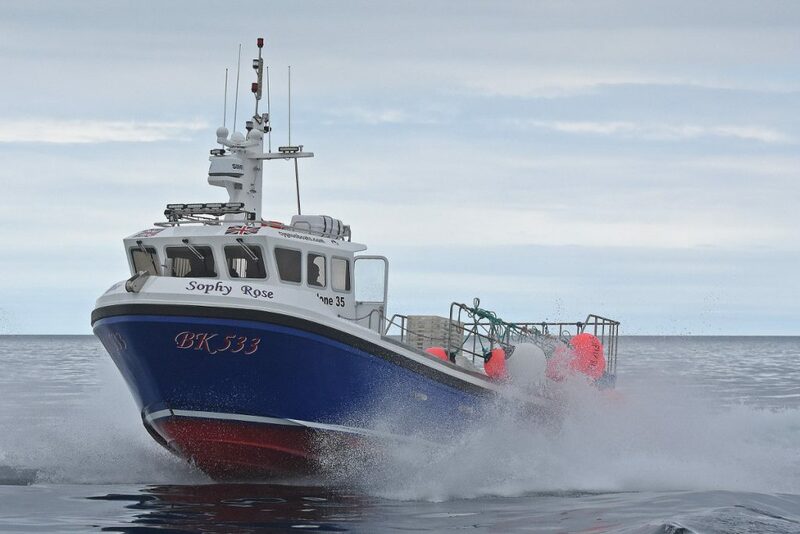 With a string of parlour pots stowed on deck, Sophy Rose maintains her speed well, typically doing 14-15 knots at the same rpm. 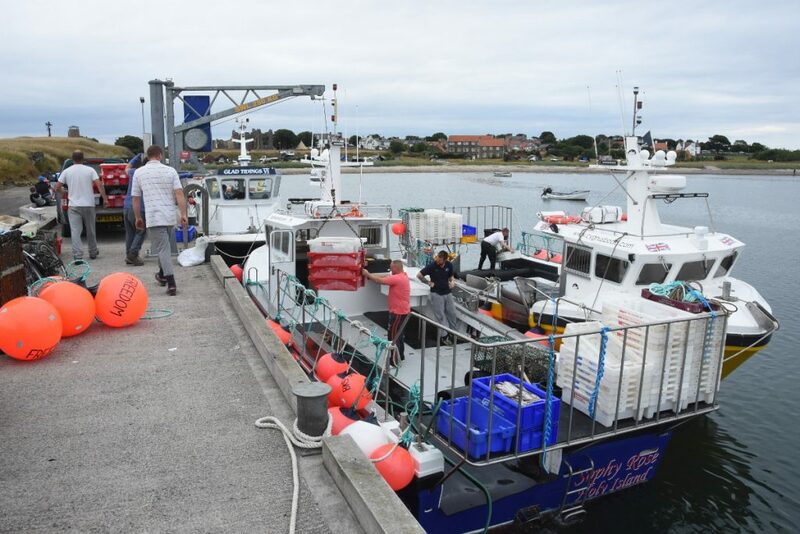 The first week of fishing, following receipt of Sophy Rose’s fishing licence and associated paperwork, resulted in an encouraging economical rate of fuel consumption that the owners were initially content with, while waiting to confirm their thinking with firm figures. 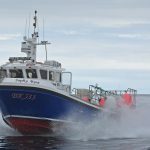 Provisional calculations suggest that Sophy Rose uses around five litres of fuel per mile when run at the normal service speed, thereby saving two hours of time per day when working the offshore grounds. Hydraulic power for the pot hauler is provided by a Spencer Carter pump driven from a gearbox PTO. 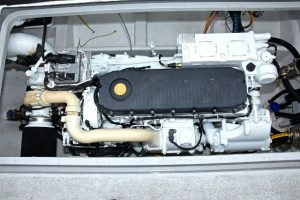 The vessel’s 24V electrical system comes from a 70-amp engine-mounted generator. Two tanks aft carry 1,200 litres of fuel. A Jabsco deck wash pump is also installed. All the control valves for the seawater systems are conveniently located on the starboard side of the main deck. 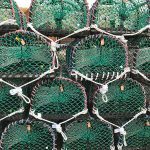 New parlour pots, supplied by Caithness Creels and identified by NIFCA pot tags, ready to fish on Sophy Rose. Sophy Rose’s well-proportioned wheelhouse, in which bench seating is fitted to port opposite the helmsman’s console, also leads to the forward accommodation cabin, where two bunks are arranged along the starboard side of the hull. One of the key features on Sophy Rose is the presence of a robust stainless steel mooring post extending the full height of the forward cabin and heavily secured into the keel and whaleback. 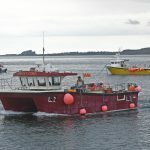 This highlights the fact that like all Holy Island boats, when not at sea, Sophy Rose is continually riding to a bow mooring. Whenever possible, this takes the form of a non-tidal berth in the outer harbour. When severe storm-force gales are forecast, particularly from the southwest, the Holy Island fleet moves to a secondary set of moorings in the Inner Ouse, where boats take to the soft bottom for around three hours either side of low water in a marginally more sheltered location. 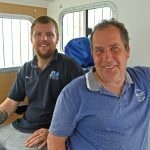 Although watching their life’s work riding out a force 10 – or higher – storm on the end of a rope is clearly not an ideal situation, it is, by necessity, one that Holy Island fishermen are fully conversant with. The groundgear for Sophy Rose’s mooring in the outer basin comprises two 250kg spade anchors together with 15 fathoms of heavy 26mm stud-link chains, each weighing around 1.5t, positioned 200m apart in an east/west direction. 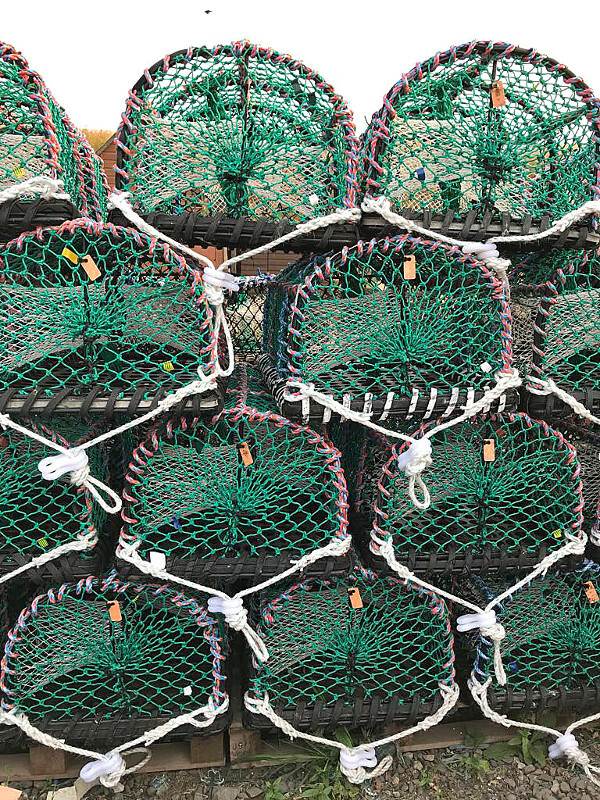 Sophy Rose is secured to these anchors by two 20m lengths of eight-strand 4in-diameter rope, identical to that Gael Force supplies to ferry and salmon farm operators throughout Scotland. 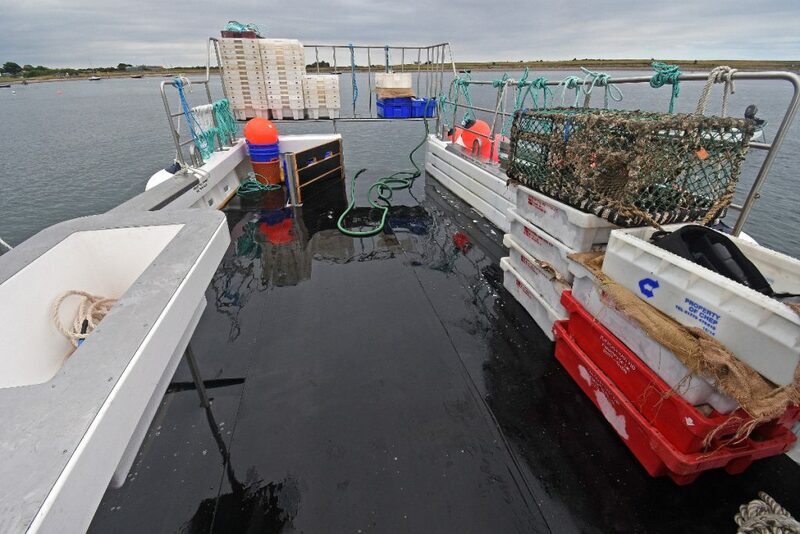 This mooring arrangement allows the boat to ride to one anchor when lying to the flood, before the weight is transferred to the second anchor when the ebb tide begins to run. Checked regularly, these mooring arrangements are well proven, as well as being fairly easy to work, with the two ropes being quickly slipped off the mooring post in the morning after the engine has been warmed, before a long boathook is used to pick up the buoyed ropes later in the day, when they are quickly secured again. 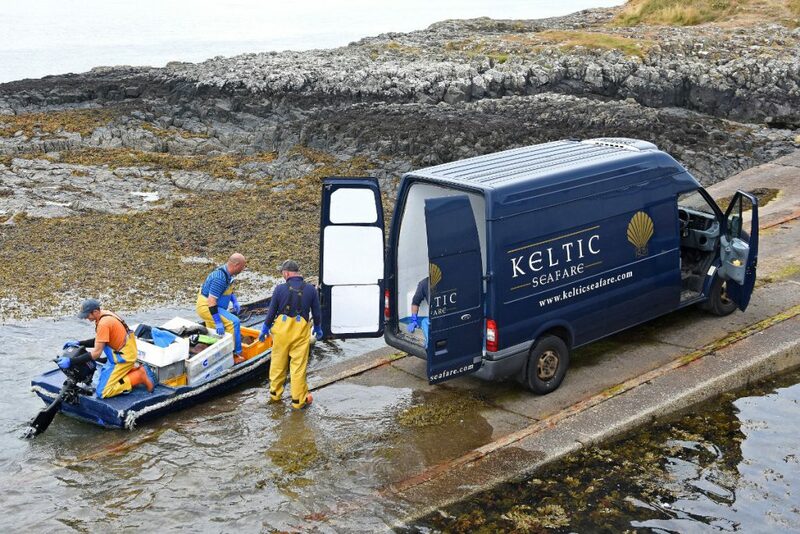 The use of offshore mooring throughout the year means that pick-up trucks and traditional punts are an essential part of the daily routine, continually being used to transport bait and shellfish catches, often in fairly challenging conditions, either from the foreshore or the slipway. The array of top-end electronics equipment fitted on Sophy Rose was supplied by Tommy Lough of SIRM UK’s outlet at Eyemouth. 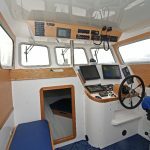 The comprehensive package is grouped together in a modern streamlined console on the starboard side of the stylish wheelhouse, which is fitted out to a high standard of finish. 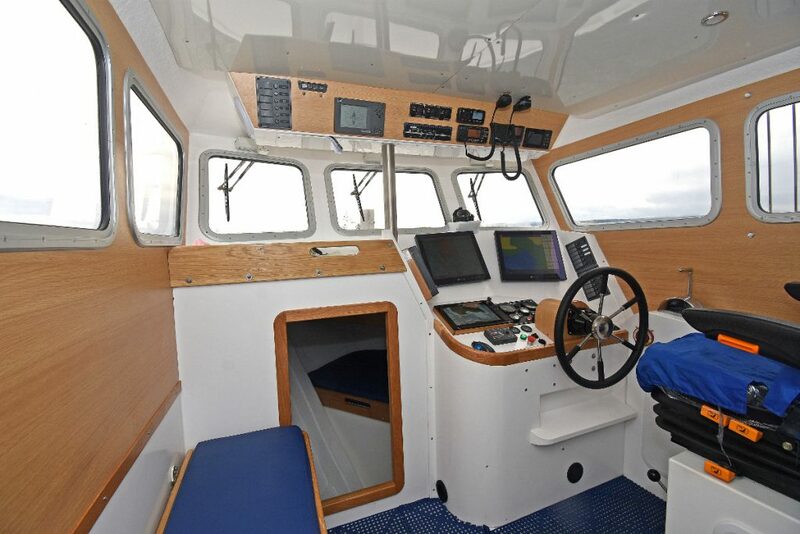 Navigation and gear locations are handled by an Olex 3D seabed mapping system with ground discrimination software and AIS interface, displayed on a 17in Neovo flush-mounted screen positioned directly in front of the KAB helmsman’s seat and a Lorenz BB chart controller with 17in LCD monitor. Vessel positioning data is obtained from a Furuno GP39 GPS receiver. 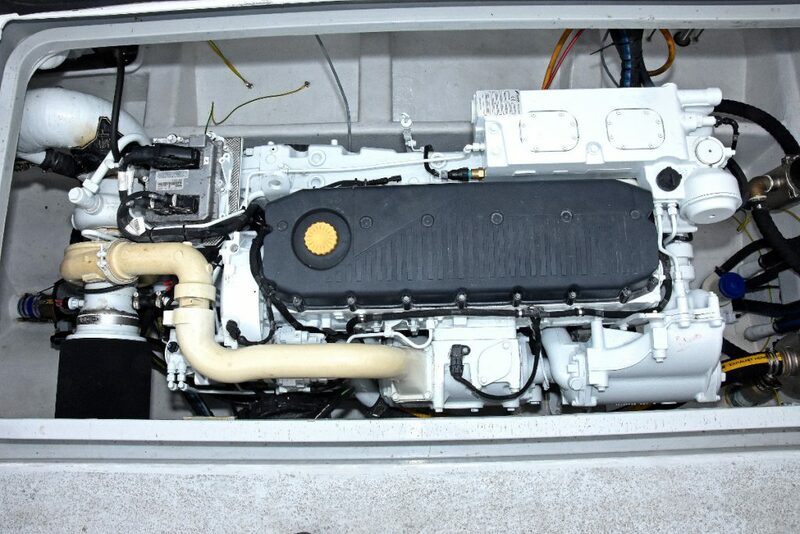 The Simrad AP60 autopilot system is interfaced to a JRC JLR-21GPS compass and constant-running pump. Bottom-sounding duties are handled by a Hondex HE-7300 colour sounder and a Simrad NSS 12in Navstation with Structurescan 3D transducer. A Simrad R2009 4G broadband radar, Simrad NAIS Class B AIS package, Icom IC-M323G GPS VHF and Jotron 60S GPS EPIRB complete the electronic equipment that SIRM UK supplied for Sophy Rose. 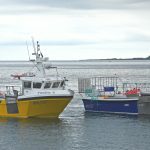 Consisting of five full-time shellfish boats, Holy Island’s small inshore potting fleet has a considerably different look today than it had a decade ago. 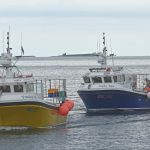 This is entirely due to the commitment lifelong local fishermen continue to bring to both the fishing industry and the small island community they live in. Renowned as the birthplace of Christianity in England, Holy Island is unique in that it is connected to the North Northumberland mainland by a three-mile tidal causeway. On highwater springs the roadway can be covered by up to 2m of the North Sea. Despite numerous warning notices pointing out the dangers associated with trying to cross outside the clearly displayed and widely accessible tidal windows, which cut off Holy Island for up to six hours twice a day, motorists are regularly forced to abandon their vehicles to the inrushing tide and make for the sanctuary of the high-standing refuge box. 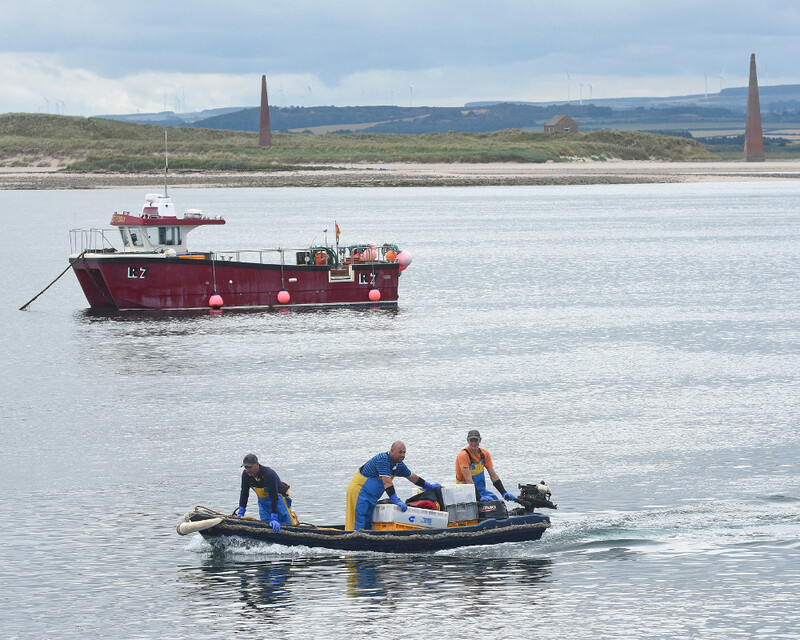 From there, they inevitably have to be rescued by the Seahouses RNLI inshore lifeboat crew, who often tow their rescue craft the few miles north by road before launching it at the start of the causeway. In spite of all the warning notices, each year the emergency services receive around 10 rescue callouts to Holy Island causeway, each of which entails an estimated cost of nearly £10,000. 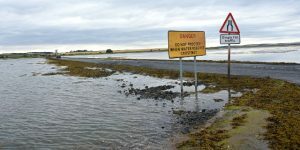 Holy Island causeway can be covered by up to 6ft of water, frequently resulting in irresponsible drivers being stranded and requiring rescue by Seahouses RNLI. Holy Islanders live their lives around the crossing times, which although clearly representing a practical inconvenience at times, are viewed as part of their life rather than an obstruction to it. 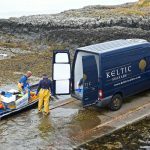 Forward planning is clearly essential, particularly for shellfishermen tasked with securing bait, landing to the tidal slipway and transporting catches daily to Berwick and Eyemouth either side of the Scottish border. Earlier this year, when the ‘Beast from the East’ roared across the UK, Holy Island was cut off from the mainland for six days by snowdrifts up to 12ft deep blocking the access road from the western end of the causeway to the main A1 trunk road leading north to Berwick and south to Newcastle, which itself was closed for 36 hours. 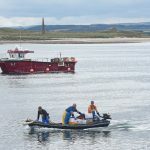 For generations, fishing has been one of the mainstays of the community of Holy Island, which is just four miles long and two miles wide. With nine miles of shoreline, Holy Island has a population of around 150 residents. 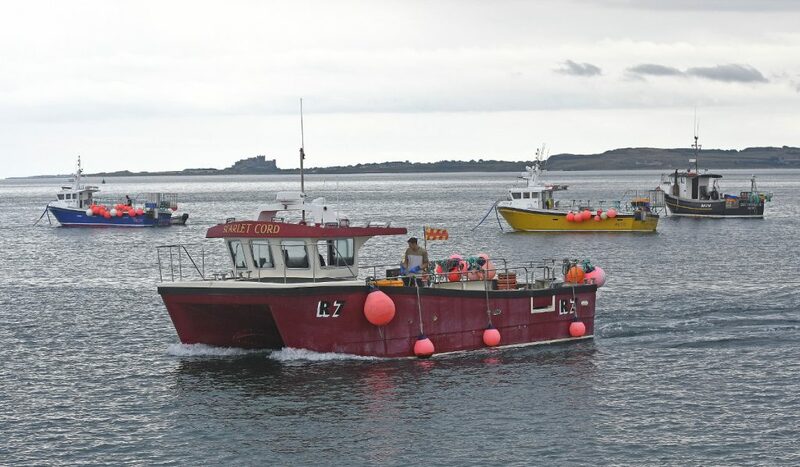 Today five potting boats – Britannia II, Evelyn Juliet, Freedom B, Scarlet Cord and Sophy Rose – fish year-round from moorings on the southern side of Holy Island, situated midway between the distinctive Lindisfarne Priory and Holy Island Castle, five miles north of the equally imposing Bamburgh Castle. 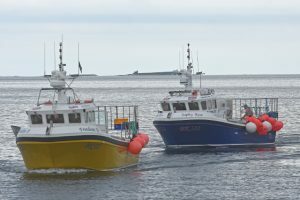 Some smaller boats also fish the local inshore grounds during the summer months. Potting activity for lobsters and brown and velvet crabs is mainly divided between the Farne Islands, lying a few miles into the southeast, or north past Emmanuel Head into the shallow and hard waters of Goswick Bay, where unexpected poor weather has claimed thousands of creels down the years. 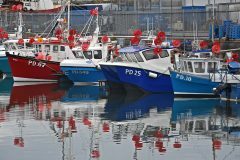 At highwater during fine weather, shellfish catches can be landed alongside a tidal pier, which incorporates a modern slipway. Steeped in history, Holy Island is understandably a strong magnet for tourists. 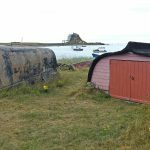 In addition to the world-renowned priory and the castles, the old fishing gear stores located on the foreshore – formed from the upturned hulls of old boats cut in half amidships, felted and fitted with a door in the midships section – are photographed hundreds of times a day during the busy summer months. 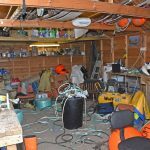 While some of these traditional gear stores are still used, in recent years local fishermen have continued to show their long-term commitment to potting by investing in larger purpose-built gear stores better suited to the needs of modern potting gear and their boats. 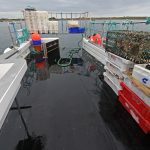 Further evidence of the progressive intent of Holy Island fishermen came three years ago with the commissioning of a large new walk-in refrigerated bait and shellfish storage building that was fully self-funded by local fishermen. 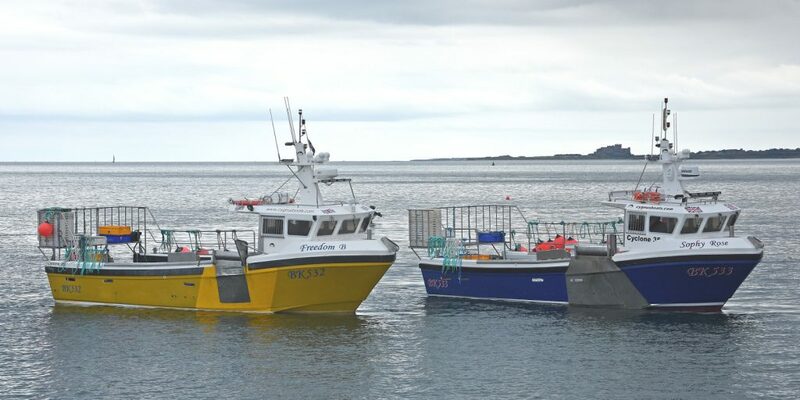 Built to replace a considerably smaller and less efficient facility, the modern refrigerated premises enable Holy Island fishermen to take larger deliveries of frozen pot bait from Peterhead. 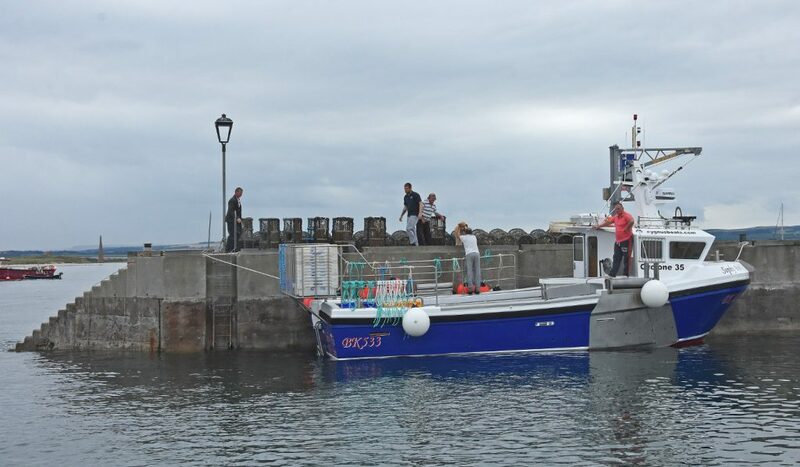 A few months later, contractors carried out extensive work to raise the height of the harbour pier, to enable boats to lie alongside the pier with enhanced safety during bigger spring tides. 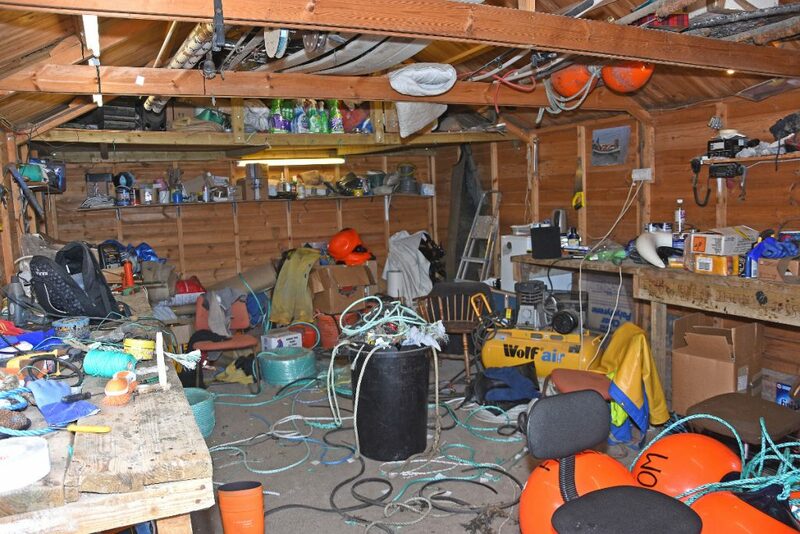 In view of the fact that the pier is regularly used when putting new static gear on boats or bringing leaders ashore for repair, in addition to refuelling, landing when tidal conditions permit, and taking bait, the importance of this development is readily apparent. 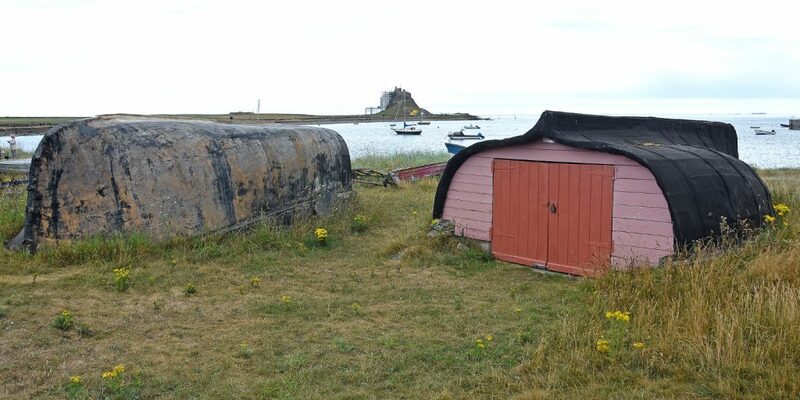 Holy Island harbour is owned and operated by the Holy Island of Lindisfarne Community Development Trust.